First-time Houston author Hime investigates a decade-old missing-persons case. Ten years after Rev. Jim Fletcher’s hell-raising daughter Alicia shook the dust of Brenham, Texas (pop. 11,952), from her feet the night of the Rodeo Dance, Sheriff’s Deputy Clyde Thomas learns that she never really left town; she’s been resting under six feet of that dust all along. 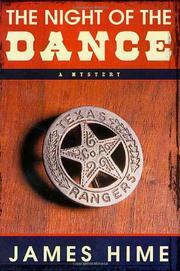 Certain that the African-American Clyde is the best detective on Washington County Sheriff Dewey Sharpe’s force, manipulative DA George Barnett, who has excellent reasons for wanting Sissy’s newly discovered murder to go unsolved, tries to get Dewey to quit courting retired Texas Ranger Jeremiah Spur as a helper and instead admit defeat by turning the case over to an active Ranger, provoking Clyde into quitting by taking it away from him. Barnett’s plan fails only because (1) Sissy’s brother Martin and his sidekick Dud Hughes kill Clyde’s protégé Jasper Jefferson during a liquor-store robbery, bringing Clyde back onto the force, and (2) the unexpected involvement of Jeremiah’s daughter Elizabeth, dying of cancer, with Sissy leads her father to offer his help. Brought together by their horse-trading alliances, Dewey, Clyde, and Jeremiah will have to face a lunatic who’s channeling divine injunctions to bomb the courthouse; a dimwit ready to take Clyde’s forbidden white lover, ADA Sonya Nichols, hostage; the mysterious “Room 15 Enterprises” that flourished ten years ago; and seemingly endless ranks of citizens determined to take whatever measures are necessary to keep Sissy’s death a mystery. Rangy, shrewd, and heartfelt: an oversized debut stuffed with so many subplots it could only have come out of Texas.